The Brae townhome development is situated south of David Avenue in Coquitlam, BC, and the development features 16 4-bedroom, 2.5 bath homes starting at 2,100 sq. ft. that include a finished basement! These townhomes feature spacious living areas with bright open kitchens and stainless steel appliances, laundry with storage upstairs and a luxurious master bedroom. The finished basements are included in the price of the home, and each home will have a private backyard and patio and a detached garage at the rear. You can count on quality with these homes, with only the best materials used to create a luxurious finish. Granite counter tops everywhere, real hardwood floors, oversized decorative tiles and deluxe carpeting are just a few of the standard features you'll see in these homes. Even though these are townhouses, one of the most attractive things about buying at The Brae has to be the promise of no Strata Fees. 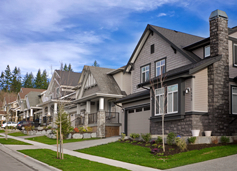 Every home will be Freehold Non Strata, where each homeowner is responsible for their own maintenance.